The thirty-six hidden saints called among Russian Jews Lamed-waw-niks. The legend that there are in every generation thirty-six secret saints, through whose piety the world exists, is based upon the following passage in the Talmud: "Abaye has said: 'There are in the world not less than thirty-six righteous persons in every generation upon whom the Shekinah rests; for it is written, "Happy are all they that wait for him" [ ]. The last word stands numerically for thirty-six'" (Sanh. 97b; Suk. 45a). The "Tiḳḳune Zohar" (ch. xxi.) goes still further, and, quoting Hos. x. 2, "Their heart [ ] is divided," deduces from , which numerically represents seventy-two, that there are thirty-six saints in Palestine and an equal number outside of the Holy Land. Around these sayings clusters a whole series of legends celebrating the Lamed-waw-niks. The latter are represented as hiding their sanctity and as not obtruding it for show. They usually follow the humble vocation of artisans, unrecognized by the community, and denying their identity when it is accidentally discovered. In cases of extreme danger to the Jewish community they come forward to avert it; but after their work is done, they retire to some place where they can again live undisturbedly. This belief has been so universal as to raise a suspicion against any mysterious personage that he is a Lamed-waw-nik. Wiener in his "Yiddish Literature" cites a characteristic legend of such a saint living at Cracow in the time of Moses Isserles. Disguised as Ḥayyim, a tailor, this saint frustrated a plan of the Polish king to extort a sum of money from the Jews, and by his secret powers forced the king to abandon it. The king's minister who had concocted the scheme fled, and became converted to Judaism. 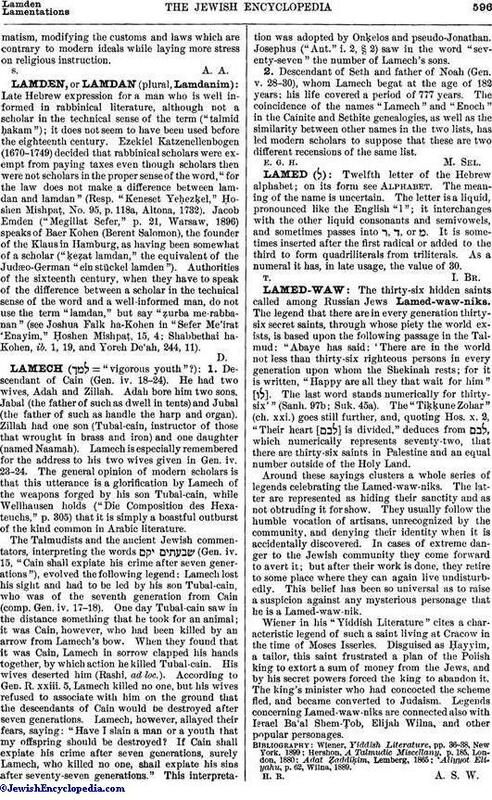 Legends concerning Lamed-waw-niks are connected also with Israel Ba'al Shem-Ṭob, Elijah Wilna, and other popular personages. 'Aliyyot Eliyahu, p. 62, Wilna, 1889.